This entry was written by Tomás, posted on 29 May, 2009. Filed under In video and tagged Arduino, interaction design, Logan. In the last decades designers have been moving away from ‘posters and toasters’ (in terms of Richard Buchanan) to a more complex scenario, computers and the Internet being pretty much responsible of this shift (according to Robert K. Logan, these are the fifth and sixth languages). For people educated as communication designers, this change move them (us) particularly to software related projects: quite a few of us have learned how to program in several languages and in many cases coding became one of our regular activities and apps like BareBones BBEdit our main tool (I would argue than in a computer dominated environment every design project produces some software output, being all designers coders by force; but I will leave this for another article). To say it clearly: after the advent of the world wide web designing and developing software started to be a realm where not only engineers could act. And I would say that the open source movement helped a lot to open and expand this frontier. Nowadays, another hard barrier is moving away: the hardware one. With the development of the Arduino board, designing hardware is open to a wider spectrum of people, particularly because of the open source community-like spirit behind the project. And designers are clearly stepping into this arena. I want to be clear on this point: I am not saying than before this designers didn’t work with hardware and that only engineers did (a prove of this is very much explained in Bill Moggridge’s Designing Interactions, a book that unfolds the history of interaction design and its main players, being quite a lot of them designers by trade). 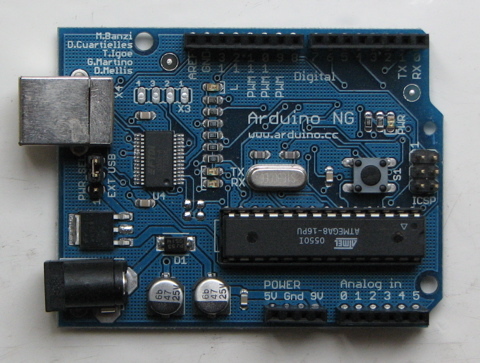 What I am saying is that Arduino makes this process easier, opening the field to many people that without this board won’t attempt to do any hardware related project by itself. And in a very good move, they are even talking to secondary students. I will certainly get one of this boards and start doing some projects with sensors and actuators myself.